I really enjoyed this fairy tale. Once again I was a few chapters in before I realized I had seen the movie, but really the movie did not do it justice (although I loved it and the casting of Claire Danes as Yvaine was inspired). Gaiman has a lovely way with the language, and his story-telling skills are well crafted, thorough, and original. It’s not hard to own something. Or everything. You just have to know that it’s yours and then be willing to let it go. Adventures are all very well in their place, he thought, but there’s a lot to be said for regular meals and freedom from pain. Next up on my reading list is his story collection Smoke and Mirrors. I’ve read several of the pieces in this collection before (“Snow, Glass, Apples” is hard to forget!) and am looking forward to re-reading them. 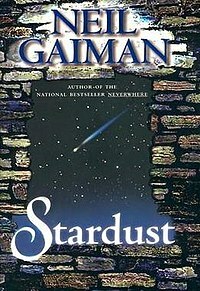 This entry was posted in 2011 Reading List, Fantasy and tagged Books, Neil Gaiman, Stardust. Bookmark the permalink. I’m definately on a Neil Gaiman reading frenzy! I’ll put “American Gods” next on the list. Thanks for the comment!